Let’s start with an assumption. Most Washington football fans don’t think Kyler Manu should start. That’s understandable. After all, the 6-foot-1, 250-pound linebacker has been at Washington for four seasons and you might have never heard his name. Heck, you may have initially thought this story was actually about Kyler Murray. This fifth-year senior is the second-most talented Kyler on his team. Or, to put it another way: Manu has made 12 total tackles in 24 career games. His former teammate, 2018 Pac-12 Player of the Year Ben Burr-Kirven, made at least 12 tackles in five consecutive games last fall. Granted, Burr-Kirven and Tevis Bartlett are both gone, which inevitably opens two starting spots for eligible inside linebackers. But certainly someone on the second level has a higher ceiling, right? Say, redshirt freshmen Jackson Sirmon or M.J. Tafisi? Or what about early enrollee Josh Calvert, or highly coveted signee Daniel Heimuli? Someone. Anyone. Bueller? Bueller? 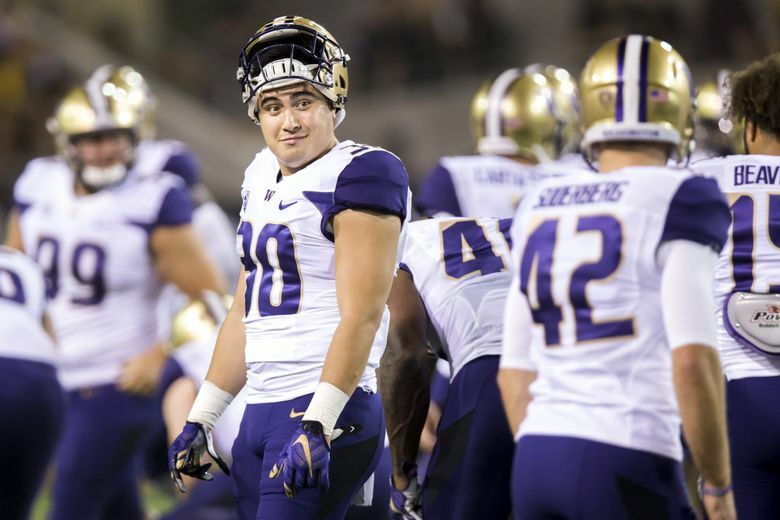 Calkins | After worst offense of Petersen era, do Huskies have tools to turn it around? Put away the Heisman hopes: What are realistic expectations for Jacob Eason? Say what you will — assume what you must — but Manu has lined up with the starters in each of Washington’s six spring practices. Maybe that means nothing. Maybe it’s little more than an April mirage. But what say you, Manu? “The expectations never changed,” said the fifth-year senior, who has yet to start a game in his UW career. “My mindset every day was to come in, grind, do what I can do for the team, earn my 20 square feet (in the locker room). I feel like I’ve done that so far throughout my career here. Chris Petersen agrees. It’s admittedly a small sample size, but seniors Manu and Brandon Wellington have started side-by-side as inside linebackers through the first two weeks of April. “Kyler’s one of those guys that’s been around for a long time and has had a lot of reps. Not as many meaningful reps as you’d like, but he has a lot of banked knowledge,” Petersen said Friday. “So he’s one of those guys – and I always talk about this, these seniors – whether they’ve been a starter or not, those are the guys that need to make the jump. Good things are happening — so far, at least. But the Huskies still have a crowded competition on the second level, and Manu is the first to acknowledge that he won’t win the job with overwhelming physical gifts. But can Manu — who has sat behind the likes of Keishawn Bierria, Azeem Victor and Ben Burr-Kirven in his relatively anonymous Husky career — be another great dawg after four essentially empty seasons? Can he exceed expectations and claim a coveted starting spot? If he does, some of the credit should go to his since-departed predecessors. “Being behind Ben was a great experience,” Manu said. “Even being behind Keishawn and Azeem, just the effort and mentality that they have going into every practice, every lift, every meeting, every game, was really eye-opening to me. I saw how focused they were on owning their job. Manu won’t be Burr-Kirven in 2019. Chances are, he won’t be Bartlett, either. But can he contribute? Can he take advantage of a long-awaited opportunity? At this point, not even Manu knows. But he understands the assumption. And he’s not ready to give up his dream — or his spot on the UW depth chart. Senior defensive back Myles Bryant has played nickelback throughout most of his UW career, piling up 123 tackles, 16 passes defended and 9.5 tackles for loss in the previous three seasons. But he has also experimented at free safety throughout the last week of spring practice. Slotting Bryant at safety would both solidify the back end behind junior Brandon McKinney and open up a cornerback spot for either Kyler Gordon or Dominique Hampton (with Elijah Molden starting at nickel). But where does the 5-9, 184-pound senior fit best? According to Petersen, “anywhere” might be the answer. “He gives us tremendous flexibility,” Petersen said. “I don’t think he really slows down much at all, whether he’s at nickel, at safety, at corner. He’s played nickel for a long, long time, so he really has the nuances of that position inside and out. He’s probably most comfortable there. 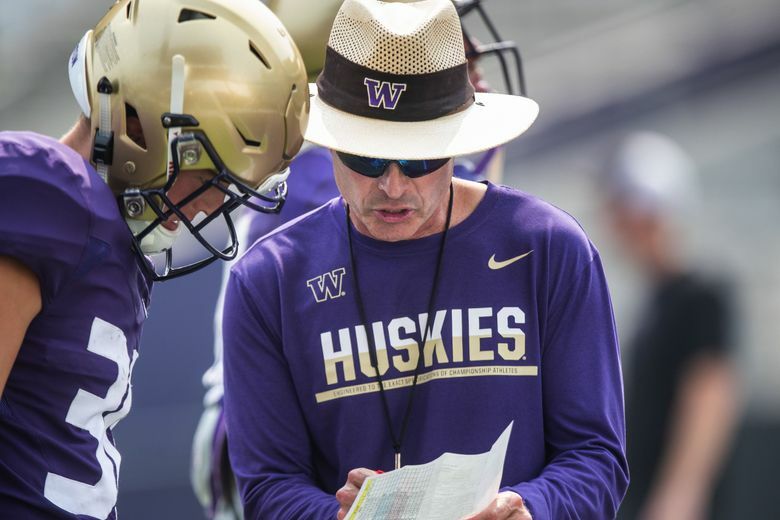 Petersen has already seen what Husky running backs Salvon Ahmed, Sean McGrew and Kamari Pleasant can do against Pac-12 competition. The same can’t be said for Richard Newton. Newton — a 6-0, 213-pound back, who gained 18 pounds of muscle this offseason — redshirted his freshman season while recovering from a shoulder injury. In Friday’s practice, he demonstrated an impressive blend of bulk and burst, taking a shotgun snap and streaking up the gut for a sizable gain. But can the Palmdale High School product crack the Huskies’ backfield rotation this fall? That’s a question Petersen is not yet prepared to answer. “I don’t know. I don’t know,” Petersen said, when asked to evaluate Newton. “We haven’t tackled one time in practice yet, full speed. They haven’t gone to the ground. He hasn’t had a chance to really break tackles. Washington’s defensive front seven has claimed a total of 10 scrimmage sacks in the Huskies’ last two practices. That could be construed as a positive development for a defense that managed just 24 sacks in 14 games last fall, its lowest total since 2008. Benning Potoa’e, John Clark and Ulofoshio led the group with a pair of sacks apiece, while Joe Tryon, Ryan Bowman, Levi Onwuzurike and M.J. Tafisi all added one as well. But, beyond a proven starting five, is there reason for concern on the UW offensive line? Maybe so. But it’s also important to consider that a progressive playbook install early in the spring annually challenges the program’s less experienced offensive linemen. “The second and third-team (offensive line) … we’ve got a lot of work to do there,” Petersen conceded. “There’s some guys that have some physical skill, but mentally getting all those guys on the same page and then executing (is difficult). But it’s really good. It’s very painful early on. It’s like taking your medicine. “I could force the defense to say, ‘You’re not running all this stuff. You’re running these two things, so they can get dialed in.’ But everything (the defense is) doing we’re going to see in the fall. So it can be a painful couple weeks until these guys really start to see things enough and have a chance to fight. Washington has routinely practiced in cold, windy, rainy, altogether sloppy weather thus far in the spring. That’s where the sixth-year Husky coach took exception. “I think the weather has been great,” Petersen said. “This is dawg weather. I want it like this. We don’t get to practice in this. That’s what everybody doesn’t understand. In the fall we don’t get this until late in the year. So for us just to be out here, this is nothing. It really is. Our kids aren’t going to bat an eye at this.